Thrillseekers, Outdoors and Adventure Activities. Joy flights, scenic flights, scuba diving, hang gliding, kayaking, surfing, sky diving, ballooning, in Byron Bay, Tweed Valley, Gold Coast, Mount Warning, Mt Warning, Tweed Coast region. everything from hang gliding to scuba diving to cruising on a Harley. Photo © Classic Aero Adventre Flights, Ballina. Get the adrenalin rushing or feel the thrill of achievement as you join others in pursuit of adventure and fun. Go on ... DARE you! Enjoy the thrill of catching your first fish or your first wave, feel the wind in your face from the back of a Harley motorcycle or in a tandem skydive. Alternatively, get a different view of the world and experience the serenity of a scuba dive or soar like the birds on thermals high above the volcanic landscape in a motorglider, microlight or hang glider. When visiting the great outdoors and our natural and scenic attractions please observe the Guidelines for Ecotourists. Tandem Hang Gliding Experience. Enjoy the thrill of soaring like a bird and taking in incredible views on this tandem flight. Get a bird's-eye view of Byron Bay that takes your breath away on this hang-gliding adventure. Introductory Scuba Diving Tour. Experience the underwater brilliance of Julian Rocks Marine Reserve. Swim with marine life such as turtles and manta rays, as well as interesting Southern Ocean animals like blue gropers and wobbegong sharks. Byron Bay's Beaches & Headlands Flight. Discover Byron Bay and its surroundings from a microlight aircraft – a 2-seat, fixed-wing aircraft with an open cockpit. 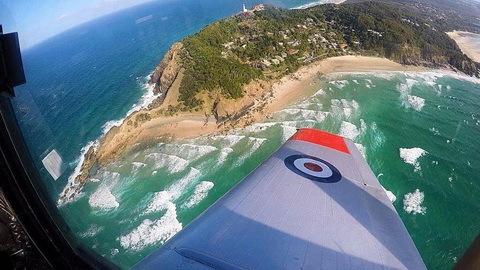 From Tyagarah Airfield, tour Byron Bay, flying from Bangalow to Main Beach at up to 2,500 feet (762 m) above the ground. Learn how to surf on the shores of Byron Bay with an expert instructor who shows you how to ride the waves with ease. Your instructor joins you in the water while providing helpful tips and tricks to conquer the waves so you feel confident and secure during this wild and wet adventure. Tandem Beach Skydive. Experience a thrilling free-fall from an altitude of 14,000 feet (4 km) and reach up to 124 miles per hour (200 km/h) on this tandem skydive. Join an expert instructor for a spectacular panorama of beach and hinterland views all the way to Brisbane and the Gold Coast. Try your hand at surfing the waves at the scenic southern end of the Gold Coast. With professional, fully qualified surf instructors, get step-by-step guidance and the best tips to help improve your skills. The area is renowned for its safe and reliable waves, making it the perfect spot for beginners. Tackle your fears and push past your limits during this thrilling adventure in the high ropes of TreeTop Challenge. Climb, balance, and leap your way through 6 sprawling rope and wire courses that span 10 acres (4 ha) of natural bushland to experience a rush you can't get anywhere else. Wave Break Island Certified Scuba Dive. The underwater world that lies off the shores of Gold Coast is the perfect place for your next diving adventure. Get to know the lively aquatic creatures while you explore the beautiful community of corals, sea turtles, and schools of colourful fish. Experience the sensation of flying and skydiving without ever getting on a plane. This indoor skydiving experience puts you in a vertical wind tunnel, so you can float weightlessly in space for an unforgettable adrenaline rush in totally safe surroundings.